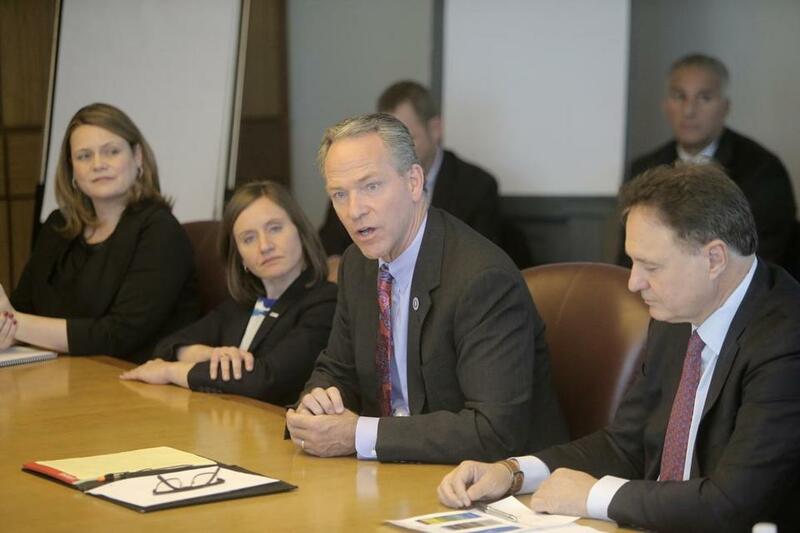 John Fish and other Boston 2024 organizers met with the Globe’s editorial board on Tuesday. Suddenly, there came a rapping, a distinct, insistent tap-tap-tapping at the Globe’s boardroom door. The team that leads the jinxed endeavor, the star-crossed effort known forever, by the title oh-so-clever, Boston 2024. 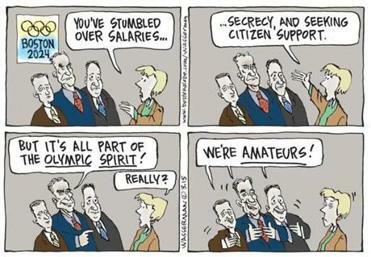 Salaries, secrecy, and citizen support. Now, ’twas very much this scribe’s wish, to pose a query to Sir John Fish, leader of the sporting core. To get an answer, or at least to try, to the problems I espy. Answers I’d expected long before. For all the debts to find repay. The public fisc would be okay. as off he went, subject hopping. Our specific queries to ignore. The bills, the debts, the ticket fares. Words rushed forth by the score — hundreds first, then thousands more — and digressions wandered off galore. Alas, they simply weren’t in store. And not just now, but forevermore? But the more John talked, the more hope faded, and the more I felt myself grow jaded. Our sense not a wee bit aided, of how our treasury might go unraided. Feeling then a frenzy feeding, came the others interceding, trying hard to stop the bleeding. Even if it meant conceding a public vote that needed heeding. Without an answer ever spying. Without public credit in the boat. To bring their hopes to resurrection. And not just talk of sporting glory, or claims that all is hunky-dory. Or another windy John Fish story.